In May 1889 Van Gogh confessed of his mental breakdown to Theo: "I am not fit to govern my affairs," he said, voluntarily asking his brother to admit him at the St Paul's Asylum. Van Gogh described the institution as being "like a third class waiting room." Hardly the place for someone who was malnourished, suffering from hallucinations and the lingering pains of self-mutilation. In an attempt to make him feel at home, he was given an extra room as a studio. 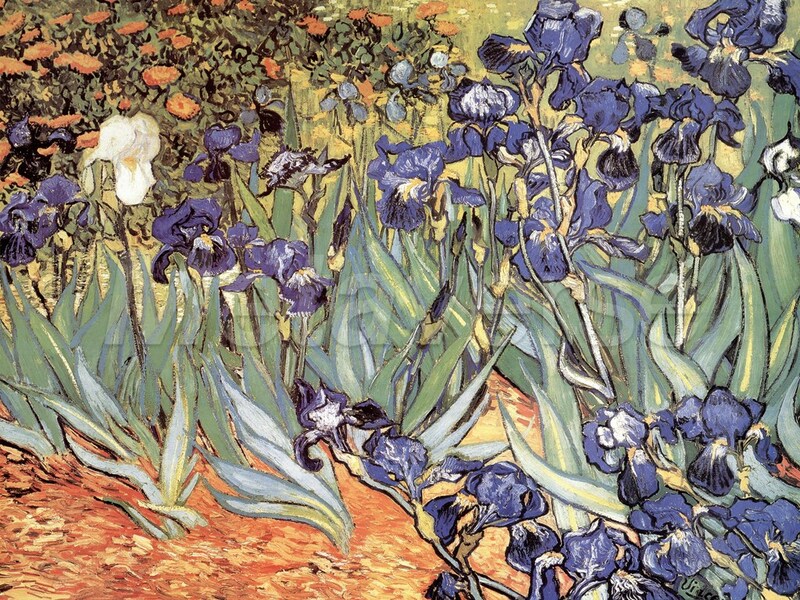 The staff also encouraged him to venture into the decaying gardens, where he discovered the irises he used in numerous paintings over the last months of his life. As with many of Van Gogh's paintings, especially those executed at this time, critics have interpreted this image more as a psychological document, than as an aesthetic product. The painting certainly provides significant insights into his mental state but, on a purely artistic level, it is also of much worth. It could be argued that the two forms of analysis achieve a symbiotic relationship, each feeding off the other. For example, the close-up view, in which a multitude of flowers dominate a skyless picture, render meaning to the psychoanalyst and art historian alike. To the former it might speak of enclosure and suffocation, to the latter of a strong overall design sense. Also, the contrast between the painting's colors and Van Gogh's method of using them produce a paradox: blue is traditionally associated with peace and calm, but here these moods contrast with bold brushwork and wild, flourishing activity.